Ezscreen designs and manufactures custom and standard touch screens and touch displays, including video walls, panel-mount touch, desktop touch, projection, 4/5/8 wire resistive, through-glass, capacitive and infrared. The Optoma X600 has exceptional brightness and amazing colours which made it the perfect choice for an inspiring visual display. The projector's image, at the distance we were working at, is over 18 ft. wide by 14 ft high, so we decided to create an animated lighting ceremony that would take advantage of the projector's full capability. On each of Chanukah’s eight nights, we lit an additional candle on our five-foot tall digital menorah sharing the beacon light not only with our congregation but with our neighbours of all faiths as well. Задача: Congregation Emanu El wanted an animated light display projected on the huge windows over the temple’s front entrance. Решение: Based on the size of the windows and the power and brightness needed, the installer, Ezscreen chose the Optoma X600. Результаты: Ezscreen converted the clear glass windows into a bright, high fidelity ‘movie screen’ quickly and inexpensively using their AnyView™ rear projection screen film. 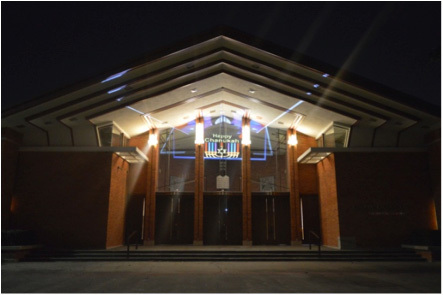 Congregation Emanu El in Houston Texas celebrated Chanukah with a dazzling animated light display that was projected on the windows over the temple’s front entrance during the eight-night celebration known as the Festival of Lights. Ezscreen, a custom screen manufacturer and Optoma partner, was approached by the temple to transform their large entryway windows into an eye catching holiday light display. Based on the size of the windows and the power and brightness needed, Ezscreen chose the Optoma X600. It had the lumen output needed for the distance, format and impact that was required. “The X600 has exceptional brightness and amazing colours which made it the perfect choice for an inspiring visual display”, said Jon Grodem, Director of Product Marketing at Optoma. Typically, just sizing the animated graphics to coincide with the rear-projection screen area would be the solution. But Steve Kroll, president of Ezscreen, realised they could do more to help the temple celebrate the Festival of Lights with the whole community. “The projector's image, at the distance we were working at, is over 18 ft. wide by 14 ft. high”, said Steve. So we decided to create an animated lighting ceremony that would take advantage of the projector's full capability.” They converted the clear glass windows into a bright, high fidelity ‘movie screen’ quickly and inexpensively using their AnyView™ rear projection screen film. It is repositionable, reusable and can safely be applied to glass and acrylic surfaces. “On each of Chanukah’s eight nights, we lit an additional candle on our five-foot tall digital menorah sharing the beacon light not only with our congregation but with our neighbours of all faiths as well,” said Emanu El’s Interim Rabbi Marc Disick. The temple will continue to celebrate with images and announcements throughout the year, not just during Chanukah.